For the recipe on this beer, please look here. A few notes on the fermentation and handling of this beer. It was in the primary for 18 days. I set the temperature to 65F for 7 days, then upped it to 66F for another 7 days, before shutting off the heat and letting it drop to the ambient of 61F for 4 days. I then kegged it, and force carbonated it. It finished at a gravity of 1.010, giving me a 5.2% abv beer. The IBU/OG ratio was 0.74, putting it much more on the bitter side, but it ended up drier then I expected, with a IBU/FG ratio of 3.6. The attenuation was 79.4%, which was higher then I expected. I am not sure if that is a product of the HERMs system I used to brew it, but I may mash hotter with this in the future. On to the tasting. Appearance: Hazy dirty orange, it has a nice head that hangs on. Taste: Toasty malty flavor. It is fairly crisp, almost lager like, with a little bit of apple, but again, I am not sure if that is not the hop vs the yeast. Overall, the esters are pretty clean, and there is a nice hop bitterness at the end, very smooth. The beer is dry, goes down pretty easily. 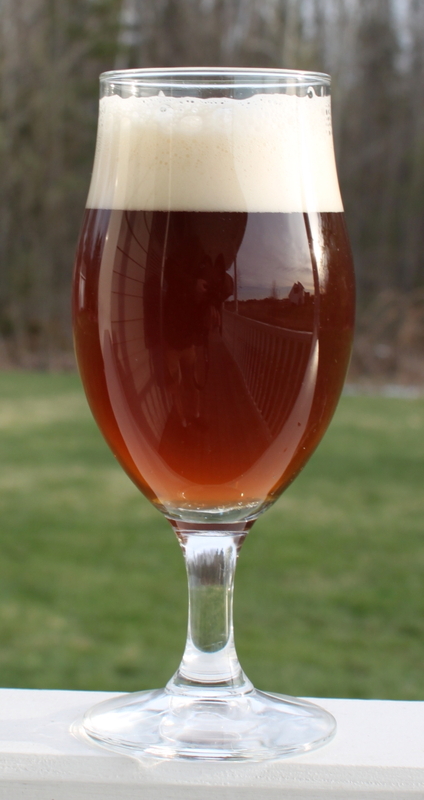 Critique — well, I set out to make a beer that was a bit maltier but it attenuated more then I expected. That being said, it is easy drinking. The malt is there, but not sweet like caramel, and has more of a toasty flavor to it from the Munich malt. I think this would make a very nice base for a brown ale, with a touch of caramel and some light chocolate for more nutty/roasty flavors. It is fairly bitter, but not in a hit you over the head way. It leave a nice dry, bitterness at the end. The yeast was pretty clean, which is what I expected, but nice to see my impressions of WLP 028 validated. It is not a complex beer, pretty straight forward, but will go down easily with the summer weather. I also learned that Palisade maybe a pretty versatile hop, but I think I would use it in combination with other hops, as it does not have a strong presence on its own, but I can see it playing well with others for complexity, kind of like adding vanilla extract to a recipe. Sounds great for the summer. I haven’t used WLP 028 before. I’ve been planning to make a Scottish ale for some time now, but it sounds like WLP 028 works pretty well in a dry beer too. Would you use it again in a beer this dry? I think it is a pretty clean yeast as far as ale strains go, and yes, I would use it again. According to White Labs, the Attenuation of this yeast is 70-75%, but I think attenuation is more a product of your wort production and your flocculation. If you mash lower and longer, and use a yeast that is more of a medium floc vs high, you are going to get a drier beer. That likely has more impact then the attenuation range the labs give. My next step is to compare it to the standard of clean ale strains, WY 1056. I am going to do a side by side with the washings of WLP028 from this batch in the near future to compare hop expression and ester production. I am looking for a “clean” ale strain to use going forward, and this looks like a nice chance to do a head to head and see which I prefer.